Cimara Cleaning Services provides a 24-hour customer satisfaction guarantee on all of our house cleaning services. This means that if you notify us of your concerns within 24 hours of your house cleaning, we will send someone back to re-clean any missed areas of your home at no additional cost to you. Your life is hectic enough without the added stress of cleaning your home. Let us help take some of the burden by doing what we already love. We’re proud to say we’ve provided quality house cleaning services for almost 10-years. Offering several customizable options, we make it easy and convenient to create a cleaning plan perfect to fit your space. Our customers will tell you we are a maid service that cleans with care– and they would know best! With a 100% Satisfaction Guarantee, you can feel confident that our professional team will make your house feel like home again. Whether you live in a cozy apartment or a three-story colonial, our dedicated cleaners are eager to get started. Cimara provides a variety of house and apartment cleaning services that can be tailored directly to your home and budget. Our light and deep cleaning options are focused on creating a healthy living environment, while always making sure your space looks its best. We would love to visit your home every week, but if you need us less, we are happy with that too. We’re committed to cleaning your home, your way, every-time. Some of our customers love to tidy up as much as we do. But not everyone has enough time on their schedule for thorough spring cleaning. This is where our exceptional team comes to the rescue. Our Spring Cleaning service is perfect for customers planning special events, going on vacation, or who just want their home to have a fresh, clean start to the season. Our crafty cleaners will polish every nook and cranny of your home- even ones you didn’t think were possible! Whatever the occasion, you can trust in Cimara to get the job done when your house needs it the most. When you’re in the middle of a move, the last task you want to stress about is move-in move-out cleaning. That’s why Cimara offers Move-In/Move-Out cleanings for those customers looking to save a bit of time and sanity This comprehensive service will leave your mind at ease about at least one aspect of your move. Our residential cleaning team will wipe walls, vacuum floors, and polish those pesky bathrooms to ensure all areas are up to the high-quality standards required. Whether you’re preparing your previous home for new tenants, moving into your new home, or both, our excellent team is devoted to creating a move-in ready space anyone would be proud of. Your focus at work should be on your customers – not on the cleanliness of your office. Cimara’s caring team understands the importance of a superb first impression. With our office cleaning services, you can provide a welcoming space for your customers right from the start. 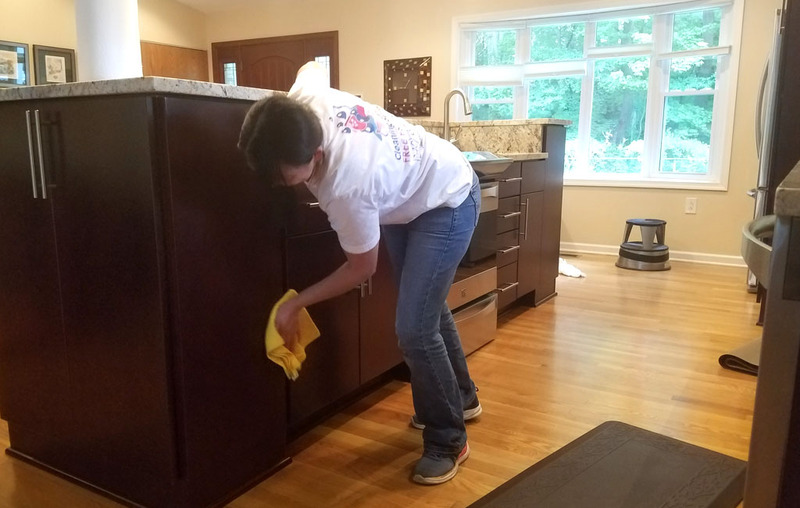 This service benefits any professional who hosts clients/customers in their office on a regular basis, or a small business owner who needs a little help tidying up. Using cutting-edge techniques, our team will have your workplace looking sharp and inviting for any prospective opportunities that may stop by. Window cleaning can be tricky depending on the design. At Cimara, we are up for the challenge! Using the best equipment and a little patience, our team will have your windows gleaming in no time. Our window services are perfect for sprucing up any home or office. Cleaning your windows can often be forgotten in the grand scheme of interior organization. But you won’t neglect to add this service to your next cleaning plan after we’re through with them!